Have changes in educational technology or pedagogy led to new (or more) conversations about how space is used in classrooms and schools? Thinking back to my earlier teaching days, I remember years ago having competitions with a colleague about making the best seating design for our respective classrooms. Aside from wishful thinking we didn’t talk or even think much about facilities. However, as an experienced educator I think a LOT more about how space is used in schools and how to get the most learning potential out of our spaces. 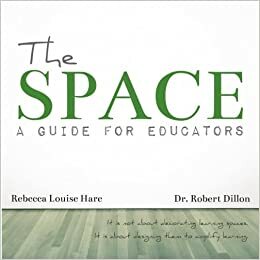 “The Space: A Guide for Educators” is a thoughtful book that doesn’t begin with the assumption schools have to spend a lot of money building new facilities, but rather strategies to increase the learning potential of what your have, and cost-effective methods to make it happen. As project-based learning, inquiry based learning, and understanding by design have taken root in Western education I believe there are more conversations about how we use space. The authors, Rebecca Louise Hare and Dr. Robert Dillon, have a cleverly structured book that takes us on a journey of reflection, collaboration and student voice. They offer ideas to put ideas into action. The design of the book itself is unique, with many images, graphics, tables and labels - along with descriptive text - that cleverly gets the ideas across. The book doesn’t even have page numbers! Note: my comments are italicized. The guide begins with a reflective process that brings students into the conversation, allowing them to consider what their learning environment provides. (and what it doesn’t) What’s the purpose of our learning spaces? Who are the spaces for? What kind of behaviours does our present learning space encourage? What kind of learning behaviours do we want to encourage? What implications does changing space have? I’m going to take the advice of the authors, out of interest, and survey students on these very things. Perhaps I’ll post on this blog the sample form. My current situation is a challenge, as teachers move to several different rooms. There are a variety of subjects taught in each individual room, so the “spaces” serve a wide range of people. That’s not a complaint; that’s the reality that will impact these considerations. The overall message is a suggested process for co-designing learning space with students and tapping into collective creativity. The next part discusses the “things” - the physical materials - that could be used to change learning space. What will support student learning in that space? We’ve been having discussions in my current school with regard to our use of space - not new facilities that we need or want, but how we’re using space. There have been some good ideas. (ie) putting in new window blinds that can be used as green screens; mounting Apple TVs so that they are moveable; refurnishing that allows for the entire room to be mobile. Our Middle School classes all have whiteboards on the walls, which I’m loving. I disagree with the argument that brainstorming doesn’t support learning. So, what kind of things do the authors suggest? You’ll have to get the book, but here is a brief synopsis. The authors also mention quiet spaces and spaces that showcase student learning. An important point made is that we can transform schools into places where students are creators, and not merely buildings in which students acquire knowledge. Creativity is digital, physical, spatial, and experiential. This is a discussion for the teacher who wants to transform their classroom into a creative space, offering suggestions to get started. They mention going to an Arts teacher, which makes sense, as students are often on differing tasks and moving around the room. I’m thinking that planning and management are the big issues here. The advice revolves around what to do with materials and establishing routines and classroom protocols, and moves on to emphasis that “creating is the learning process”. Hare and Dillon graphically outline a process that goes from curiosity and research to showcasing learning and building on that. Start simple and don’t worry about having high tech equipment. Students will be creative and solve the problems of planning and production. Cheap green screens can be fashioned, cardboard and small whiteboards are great, and video editing is available. (YouTube Editor has come a long way if one doesn’t have common software such as iMovie or MovieMaker) The key principle is to create a space that allows for creativity. The author discuss physical maker areas. (also known as makerspaces: see https://goo.gl/NXPH2q or https://goo.gl/xk7WDl) The authors give a number of suggestions for creating this kind of space. Keep in mind that this isn’t simply another art room. They also differentiate between digital maker areas, spaces that make have green screens, whiteboards for planning, or allow for music production. What is the point of making something that isn’t used or shared? However, the point Hare and Dillon make is to showcase the learning process - not just the finished product. Use the walls for learning, not solely displaying, showing the progress, making walls interactive and interpretive. Don’t just throw things around the room, but have space planned with colours, furniture and everything in mind. Get rid of clutter, leave some space open, and be mobile. The authors remind us to plan who is responsible for showcasing, when things go up and come down, who the audience is, and think about diversifying the kinds of materials showcased. Some of the examples they give include magnet walls, digital portfolios, and hanging ideas from the ceiling. I think this is an important point. Students also need a place to be left in peaceful thought. School libraries are transforming into collaborative spaces, not the quiet places I grew up with. Some suggestions include reducing visual noise in the classroom, giving quiet time during lessons or playing quiet songs, or have moments of reflection. Hare and Dillon also suggest creating classroom spaces that allow a student to hide for a little while (kind of like a Google office cubicle), or giving options to not collaborate sometimes. Overall, balance the stimulation in the classroom - we don’t have to be rapid fire, “go go go” all of the time. Have a look at the suggestions the authors provide. The final section of the book takes time to offer some additional advice as you might choose to reimagine your classroom (or school) space, probably the most important encouraging us to be intentional. Create a culture of “yes”, encouraging students to try new things and push their limits, being unafraid of unknown results. There is a brief discussion on the impact of colour on learning. (something worth delving into more) What are some of the things we may not take into account in our learning spaces? The ability to control light on sunny and cloudy days; decorations; the nature of the windows. They remind us that materials we may need to foster creativity are revolving; when we don’t have all the materials we’d love to have challenge students to improvise and be creative in their problem solving; and that learning and creativity are central to the use of space. Hare and Dillon take into account the impact of digital tools, pointing out that we can’t ignore the reality that our students are growing up in a digital world. Maximize the use of digital tools. (insofar as it supports learning, with learning outcomes at the fore) Find ways to keep the spaces free of clutter so that you’re not tripping over power cables, etc, as you make your classroom mobile. So how does a school go about transforming spaces? Though this isn’t the final part of the book, I chose to place it here in this writing. The authors suggest three parts: initial prototyping, the launch phase, and concept reinforcement. You’ll have to purchase the book for further details. ;) They also provide a recap of the Seven Principles of Design, but apply it to rethinking school spaces.